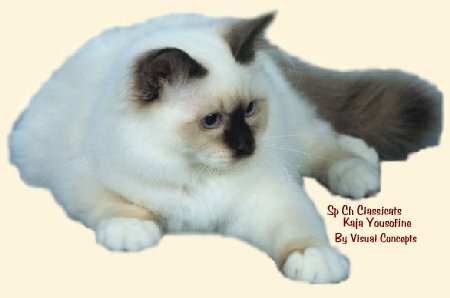 ABOVE: Top S.A. Birman of 2001 and 2002, Supreme Premier Lao Sinh Schalimar (seal point neuter), owned by Elsj� Tilley and bred by Nora Anderson (Lao Sinh Birmans). The "Sacred Birman Fanciers Group of Southern Africa (S.B.F.G. 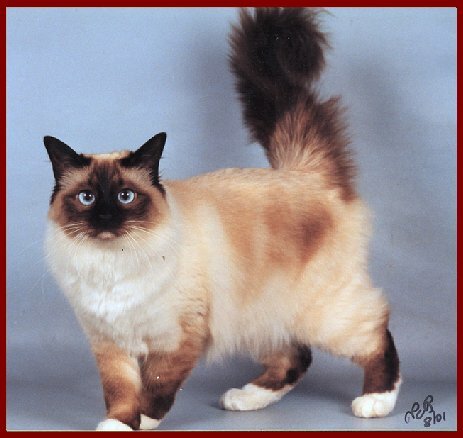 ), was formed during 1997 in an effort to establish the then relatively unknown Birman breed in Southern Africa. The aim of the Group was to bring together the small number of Birman breeders and fanciers, so we could work together to establish this magnificent breed here in our country. Today we can say that we have achieved this goal, and the Birman is one of the most popular breeds in the country. Our Group, which is an official Breed Group affiliated to the Southern Africa Cat Council (SACC), has grown into one of the largest Breed Groups in the country, with almost 200 members from around the world. We've held 7 very successful ALL BREEDS CHAMPIONSHIP SHOWS over the last few years, and during 2001 we had over 50 Birmans making their appearance on the show benches around the country. Looking at our lovely S.A. Birman Gallery, it is clear that we have some truly magnificent cats in this country - the result of the hard work and dedication of our Breeders. To encourage a greater interest, appreciation and knowledge of the Birman cat in Southern Africa. To encourage responsible breeding with the purpose of improving the breed. To cultivate friendship amongst Birman owners, breeders and fanciers worldwide. To publish a bi-annual magazine containing Birman and related issues. To educate and promote responsible pet ownership, which include neutering and spaying of pets. To assist in the rescue and re-homing of Birman cats. Furthermore we promote the breeding of Birmans with good health, temperament and conformation, preserving the type of the Birman without changing its features or breeding to extremes. This site will be updated soon. Our apologies for any inconvenience caused.